The 10 Coolest (and Most Unique) Hotels in North Dakota! From immaculate hotels that date back over to the late 1800s, to cozy bed and breakfast spots, to magnificent castles that treat you like royalty, North Dakota is home to some truly unforgettable overnight experiences. Here are the 10 most unique hotels in the state. Ever dreamt about spending a night in a castle? Thanks to the Enchanted Castle in Regent, you can? Complete with a Medieval Tavern and an elegant restaurant that serves everything from King’s Filet Mignon to Court Jester’s Shrimp, the castle provides visitors with a one-of-a-kind experience. Two of the castle’s 19 rooms include a four-person hot tub, perfect for that romantic getaway. As if that wasn’t enough, the Enchanted Castle also includes a full court gym, fitness center, and two multi-person hot tubs. Nothing epitomizes the culture and swag of downtown Fargo like the Hotel Donaldson. Known as the “Ho-Do” to natives, the hotel includes art-filled rooms that will make you feel like you are a bit more refined than when you arrived. The building served as a fraternal lodge and hotel for more than 100 years before experiencing an extensive renovation. The result is a hotel, lounge, and restaurant that is the mainstay of downtown Fargo’s revitalization process. In addition to offering a unique lodging experience, the Ho-Do is often the site of literary readings, concerts, and art shows. To make the experience even cooler, check out the hot tub on the building’s roof. Located in eastern North Dakota, the Sanctuary Guest House offers one of the most intimate and custom-made lodging experiences in the state. The site of several celebrations over the course of the year, including a fall celebration that is a visitor favorite, Sanctuary strives to provide guests with a well-rounded experience as opposed to merely a night of lodging. Beware, after sampling the house’s homemade treats, teas, and made-from-scratch meals, you may not want to leave. Plan ahead, however, as Sanctuary only has four rooms. For the nature lovers in your group, a trip to Pipestem may do the trick. The hotel is a working family farm that provides guests with unparalleled, guided birding opportunities. No other lodging facility in the state offers such an intimate and unfiltered chance to commune with the state’s natural inhabitants. The site also includes several beautiful gardens and three historic buildings, two of which have been renovated for lodging. The third building has been turned into a mini-museum that details the history of the farm. A combination of old-world meets new comfort, the Williston is perfect for those looking for comfortable elegance. With dark wood floors, stylish furnishings, and lustrous granite countertops, the rooms will make you feel like you stepped into a four-star luxury hotel. Despite the recent renovations, however, the Williston still has the feel of a turn-of-the-century lodge, giving you the best of both worlds. If you need an extended stay, this is the place. The hotel includes six rooms, each with full kitchens, living rooms, and bedrooms. The site is also home to the Eleven Restaurant and Lounge. Located on the beautiful Coteau des Prairies, the rustic lodge is perfect for those looking to escape the hustle and bustle of city life. Built with North Dakota pine, the lodge combines log and steel architecture to create a stunning and unparalleled lodging experience. 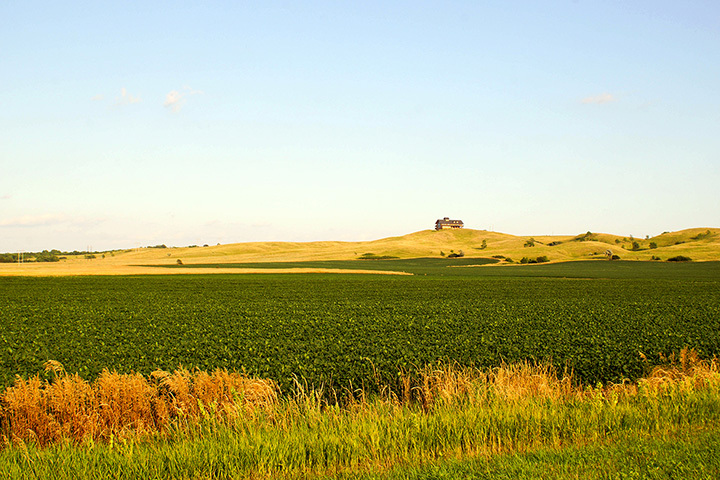 Owned by a farming family, the site includes a rolling pasture full of the family’s cattle and a lookout that allows guests to take in the beauty that is North Dakota. Add in homemade meals and outdoor expeditions, and a visit to Coteau des Prairie Lodge will be an unforgettable event. A visit to Dakotah Rose will be a step back in time. The home has been renovated to include modern amenities, but the sophistication and elegance of days gone by has been preserved. Individually owned and operated, the bed and breakfast is committed to providing guests with an unforgettable experience. Whether indulging on homemade treats or sampling the large collection of wine and champagne, you will be pampered from the time you walk through the door. Although the service is notable, the century old building itself is really the star of the show. Located along the Souris River, Dakotah Rose features breathtaking stained and beveled glass throughout and a clear glass cameo window that provides guests with an unparalleled view of the city. Looking for a bed-and-breakfast type of experience? The Ashley Lodge is for you. With two floors of expansive suites and a third floor that includes a large bar and kitchen, the lodge is as perfect for those looking for a romantic getaway as it is for large groups. Individualized services will ensure that all your needs are met and help you enjoy a relaxing and rejuvenating stay. The historical building alone, built in 1921, is worth a visit. For those looking for an inimitable, peaceful, and relaxing escape, the log cabins at Lakeview are perfect. Located along the Jamestown Reservoir, the resort includes cabin which are all equipped with unique and stylish furnishings that are a mix of rustic and contemporary design. Lodging choices include an English manor-style cabin, an Heirloom loft-style cabin, a new Heritage cabin, and the traditional Mission, Tuscan, and Yorkshire cabins. The site also includes a RV park. Element is one of Fargo’s newest hotels and it is a perfect example of the current push towards sustainable and eco-friendly design. The site offers a complimentary breakfast far, fitness center, heated indoor pool, oversized hot tub, and dry sauna. To cap off your day, a visit to the site’s gourmet pantry may be in order. Regardless of what you do while visiting Element, the company’s commitment and dedication to reducing its carbon footprint is impressive. From utilizing water efficient fixtures to creating an extensive recycling program, the hotel is indicative of tomorrow’s lodging experience.